UPDATE: Welcome minions of Glenn Reynolds, Reason and NRO's The Corner (thank you Jonah!). Please, for the love of all that is good and holy, Blogroll The Jawa Report! and come back often for all your commie-propagandist fisking needs. UPDATE 3/09: A new post is up documenting Giuliana Sgrena's Lies, Inconsistencies, and Treason. 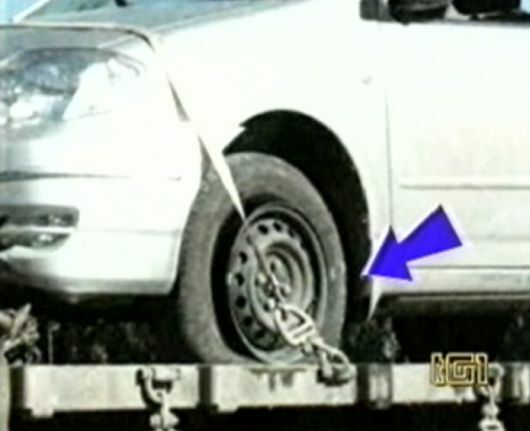 Italian television station Tg1 is running images of a car purported to be the one used by Giuliana Sgrena. If this is the car then it would contradict earlier reports that Sgrena's rescuers had used a truck. 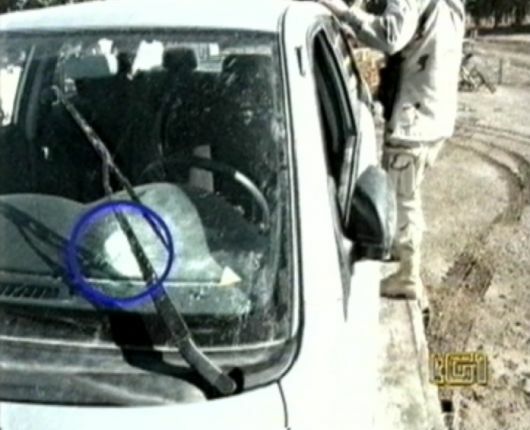 If accurate, the condition of the car would also directly contradict the story told by Sgrena in which she claimed 300-400 bullets were fired, one of which hit Italian secret-service agent Nicola Calipari. Earlier reports of what was purported to be Sgrena's get away car proved inaccurate. UPDATE: I am inserting these AP photos because they are much clearer. I found them via House of Wheels who in turn got them from Charles Johnson. Only a single bullet hole can be seen in the image below, taken from Italy's Left-Wing paper LaRepubblica. The Google translation of the captions that go with these photos is not clear. They may claim to show more bullet holes where indicated, but if they do then my eyes fail me. Perhaps the tire shot, but the rest don't seem to show any real damage. 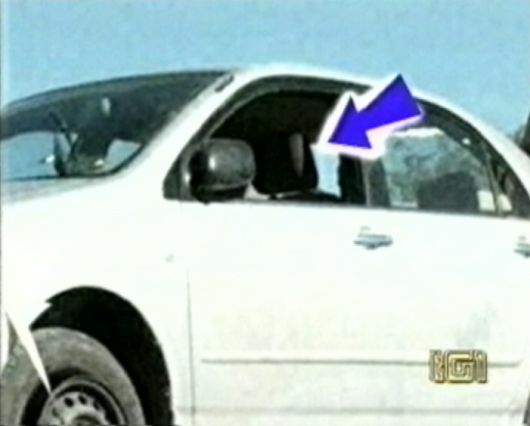 "The car in which Giuliana Sgrena and Nicholas Calipari travelled with American bullet holes. The images were transmitted from Tg1." big shout out to Eddie for tipping me on this. "The car was travelling at a speed that couldn't have been more than 40kph," Fini said. He said that a light was flashed at the car after a curve and that the gunfire -- lasting 10 or 15 seconds -- started immediately afterward, disputing US military claims that several attempts were made to stop the car. We were on our way to the airport when the tanks started to strike against us and he tried to cover me and he was shot. He died and, me, I was safe but he was dead. 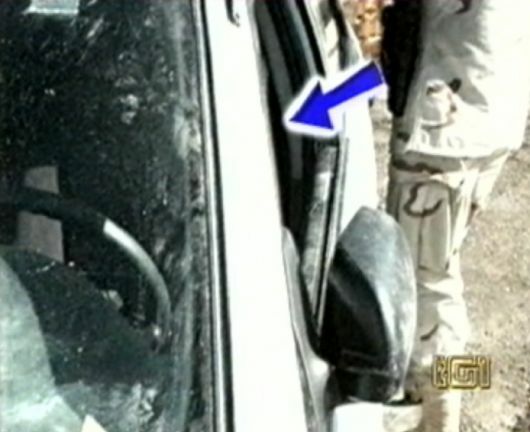 The Americans shone a flashlight at the car and then fired between 300 and 400 bullets at if from an armoured vehicle. The 3rd ID issued a press statement last week saying the car was racing toward the checkpoint when they signaled it to stop, fired warning shots and finally shot the engine block of the car. The shots killed one and wounded two, including the journalist. 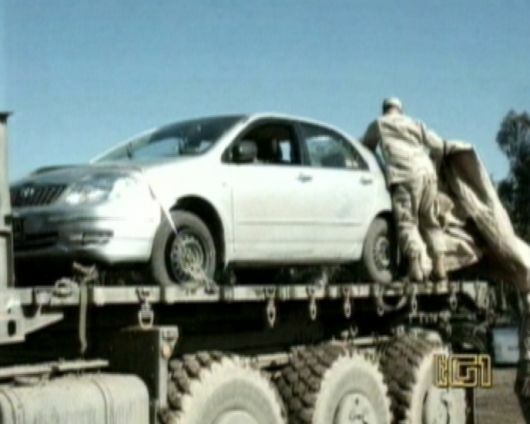 The Army's 3rd Infantry Division, which last week resumed command of Baghdad operations after participating in the 2003 invasion, said the soldiers had warned the approaching car repeatedly before opening fire. According to the division, the patrol attempted to warn the driver to stop by hand and arm signals, flashing white lights, and firing warning shots in front of the car." Of course, we now know they missed, but it is a far-cry fom a deliberate 'assassination' or 'ambush' as Sgrena puts it. senior U.S. military official tells ABC News he believes the investigation into the fatal shooting of an Italian intelligence officer by U.S. troops in Iraq will ultimately prove the officerâ€™s car was traveling in excess of 100 mph. 1. The US Soldiers are brilliant marksmen by placing multiple bullets through the same hole. 2. The US soldiers are terrible marksmen, firing 300-400 rounds at the automobile and missing a huge percentage of them. 3. She is a lying #$%#$% communist, who has an ax to grind against the US and its Iraqi strategy and is using this to further her own aims. Looks like the crack staff of Six Meat Buffet find the, er, real car impounded down at Cooter's place until Sgrena pays a fine to Hazard County. Evil White Guy has a good compare and contrast picture between Sgrena's car and Bonnie and Clyde's. UPDATE: Pirate's Cove "...pictures from La Repubblica of the car that Giuliana Sgrena was riding in as the guns and tanks and A-10's and outer space death rays attacked her, all ordered personally by President Bush, of course." ha! ---Sgrena would have gotten away with it too, if it wasn't for those meddling bloggers! ---heh, no one does funny quite like Jeff Goldstien. --Sobek Pundit finds this, ahem, photo correction released by the AP. Looks like Sgrena's version of events is right on. --Ken Wheaton finds the inevitable Sgrena-Star Wars connection! UPDATE: Ok, I promise no more updates. Confederate Yankee does a bang-up job analyzing the rate of fire of various weapons in use in Iraq (and various other CSI type stuff) and comes up with the *shocking* conclusion that Sgrena is a *liar*. Also on the trail of that lying commie propagandist: MH King, OpiniPundit, LGF, James Joyner, Michelle Malkin, Scared Monkeys, Way Off Bass, In the Bullpen, Kevin Aylward, Evil White Guy, Now You Know, Myopic Zeal, Captain Ed, Slant Point, Armageddon Project, Red State Rant, The American Mind, Slings and Arrows, Coyote Blog, Jacob's Room, Joust the Facts, SondraK.....wow, I sort of lost track after here. Just look down the trackback list. If you tried to trackback and got an error, please e-mail me.